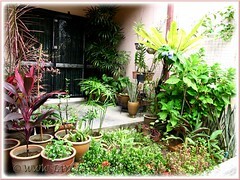 We just couldn’t manage to tend to our garden plants due to my illness. Despite being almost neglected, our babies thrived well with nature taking care of them. Our tropical climate with heavy showers and abundant sunshine did the job for us, thank goodness! that is botanically named Mussaenda philippica ‘Aurorae’, as seen, is the happiest of the lot. Truly our garden star for the month of April 2012. Spectacular and sparkling with its off-white crowning glory, it is a sight to behold and truly uplift our spirits! This tree was given a bald crop last October when it was heavily infested with mealy bugs. We did think of removing the whole tree altogether then. Fortunately, we decided against it and it’s rewarding us wonderfully. We’re giddy with delight at the resulting appearance! It has never been so beautiful and stunning before. This attractive blooming tree is really a hot traffic-stopper that illuminates our garden, and especially remarkable in the late evening… wow!! Is this Begonia ‘Eureka Green Leaf Pink’? How lovely to come across this volunteer plant (sprouted itself) in one of our pots, sharing space with the young Bougainvillea ‘Aiskrim’. 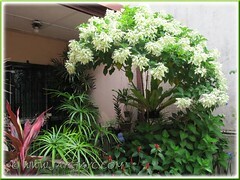 A pretty-looking plant that grows rather fast, spotting bright green leaves and pink flowers. 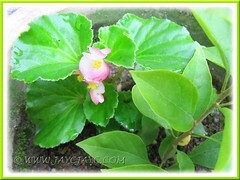 I last saw this Begonia species umpteen years ago, during my teen years. Hence, this attractive volunteer is surely a most welcome treat! I’m so glad to hear from you about your speedy recovery. And that the garden had graced you with wonderful showers of blooms. I had those Begonia and it had sprouted from my cactus pot and somehow also appeared from the corners of the bricks and moss. Not sure that they are specifically from the Eureka collection hybrids – What is safe to say is that they are the Wax Begonia. Propagating them is quite a challenge – usually I often trim and older stalks and replant them as they mature. Out of 7 stalks – 3 to 5 manage to regenerate. Leaving them – just like that – they end up maturing to death. Watch out for whiteflies & mealy bugs – they just get attracted to them. Glad to see you blogging again. Hope you’re all set with high spirits and strength to tackle your illness. @ James : Thanks, dear friend… our merciful and loving God is good all the time and has answered our prayers. I’m much stronger now. 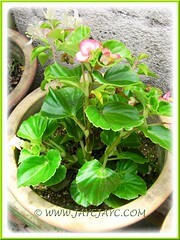 Thanks… appreciate too the extra info you’ve shared on begonia culture and will follow the link provided when I’m free. You have an interesting blog. i stumbled on your blog when googling for tips on growing pandan, in a pot on a balcony in Netherlands. I have taken to growing Malaysian ‘food’ plants that are difficult to get in NL, eg pandan, curry leaf (murraya koenigii), the unfortunately but popularly named kaffir lime (citrus hystrix), etc. I am not a religious person, but in my own way, i wish you well and that you will regain and maintain your Joie de vivre, and the joys of your gardening. Thanks for your compliment on our blog, sj chin. Wish you all the best growing those wonder plants that add exotic flavour to food. Thanks for the lovely comments in my blog. 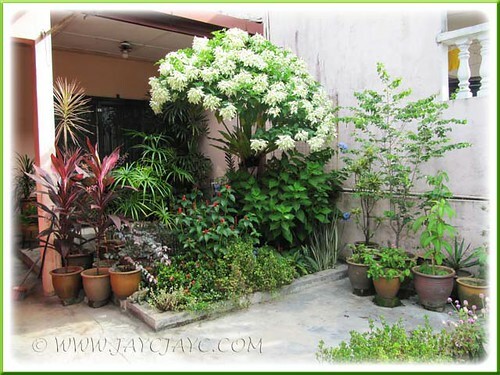 Very easy & very hardy plant – they tend to crawl out of their pot. The only set back is that if they are water-logged – they tend to rot. Thanks for the purple plant’s ID and info. Your garden looks very neat and sparkling clean. The white mussaenda full of blooms now. In the before picture, I could hardly notice it. A toast to your recovery and good health, Jacqueline! Thanks, A.Belle! Hmm… looks like our nature is being reflected in our garden setting as well, huh! Cheers and a toast to your good health too, my friend! I must have missed a few posts! sorry you were ill, and I hope you bounce back to your former health. God bless you for the love and kindness you show to all. Hello, may I ask about the Hydrangea plant? I know this is out of topic, but your Hydrangea plant was so healthy! (really jealous actually) I have that plants too, but my Hydrangea kept having a dead shoot after it gave their flowers :(, plus the plant getting a lot of black spot around the leaves, which make the plants growth stunned for a months…. :'(.. I do not know how to handle this disease, please give me any suggestion and prevention for this disease..
@ Gillian : Thanks, Gillian, appreciate your well wishes and blessings. I’m recovering very well, indeed. @ Ash : Thanks, Ash! We normally prune down the stems when the flowers are spent to get a bushier shrub that result in more blooms. Re black spots on your hydrangea leaves, you may want to read the article at Georgia Center for Urban Agriculture for insights. Hope this helps.